Bob Alfandre arrived in Washington in 1935. Photo © Jim Marks. Robert Alfandre was born in Brooklyn; he moved with his family to Washington DC in 1935 when he was eight years old. He attended Anacostia High School, briefly served in World War II, and later graduated from Swarthmore College with the assistance of the G.I. Bill. After college, Bob worked for the CIA. He left the spy agency during the early days of the McCarthyite witch hunts, convinced that his life as a gay man would make career advancement impossible. Instead he focused on the modest construction company he inherited from his father, Joe Alfandre. With his brother, he became a major participant in DC’s postwar economic boom. His Aldre Construction Company built large housing developments in Prince George’s and Montgomery Counties. Bob used his wealth to become a major philanthropist for the LGBT community. Bob’s legacy lies in his generosity of time, money, and spirit. 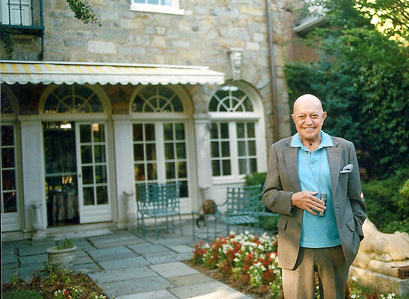 Through the 1970s, 80s, and 90s, he opened up his Kalorama home for many benefits and causes, giving early support to local and national gay and lesbian organizations, such as the Whitman-Walker Clinic, the AIDS Quilt, and the Human Rights Campaign. Beyond his work on behalf of these organizations, Bob was a major supporter of gay and gay-friendly local politicians, helping many in their first elections to city-wide positions. Through subtle persuasion of his circle of Washington’s gay social elite and his own largesse, Bob raised millions dollars for the Whitman-Walker Clinic and is largely responsible for the opening of the Elizabeth Taylor Medical Center in 1993. The in-house pharmacy there is named in his honor. Like many gay men of his generation, when Bob was young he had married a woman and had a family. When he met Carroll Sledz and the two fell deeply in love, Bob divorced his wife, and moved out of his Georgetown house and into Sledz’ Capitol Hill apartment. But he and his wife remained friends. In recent years, he remarried his wife. He has two daughters; one runs the family business while the other founded a ballet company in Newport, Rhode Island. In his most recent years, Bob dedicated a great deal of his time to the Robert N. Alfandre Foundation, still largely dedicated to easing the pain and burden of those suffering from HIV/AIDS. He currently splits his time between DC, Fire Island, Key West, and Paris. Bob Alfandre passed away on June 12, 2014 at his home in Washington, DC after a long struggle with cancer. The Washington Blade published an online obituary of him. The Rainbow History Project has an oral history interview with Bob.